陆亮, 陶陶, 訚耀保, 朱康武. 可压缩静压支撑抗偏载动态特性分析与优化[J]. 同济大学学报(自然科学版), 2019, 47(3): 401-407. 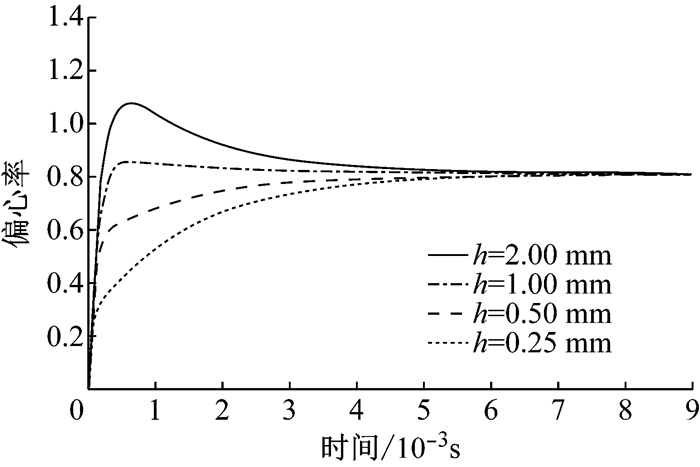 DOI: 10.11908/j.issn.0253-374x.2019.03.014. Abstract: It was supposed to employ hydrostatic bearing technology for rocket thrust vector control system, to bring its load-deflection resistance and low friction merits. 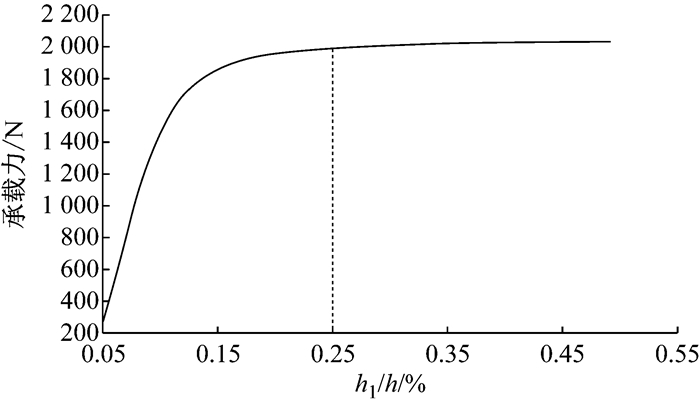 However, the rockets always worked in serious conditions with much higher and larger-span temperatures, causing the hydrostatic bearing full of gas and much compressible, which contributed to the piston rod response overshoot and vibration. 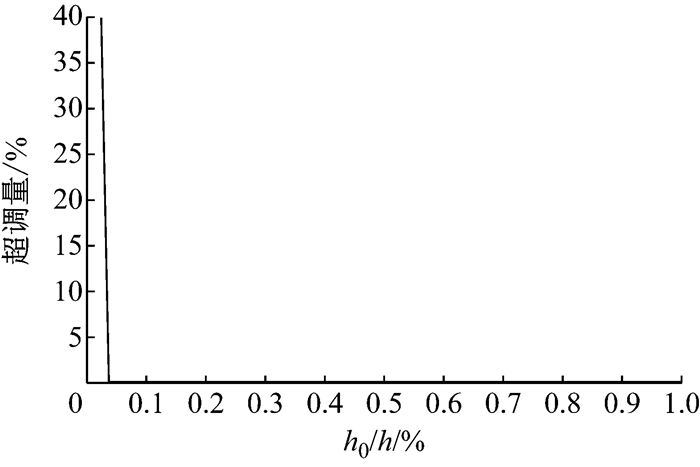 If the overshoot was too large, the oil slick will broke and lost its radial force holding feature. 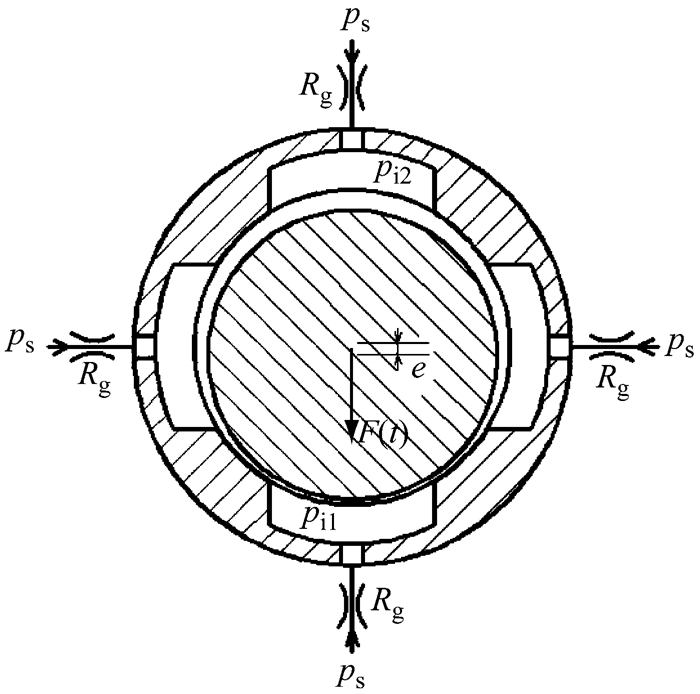 The present paper work modeled the piston rod dynamic motions and obtained the system transfer function with equation part-linearization, to conduct a detailed investigation of hydrostatic bearing dynamic behavior. 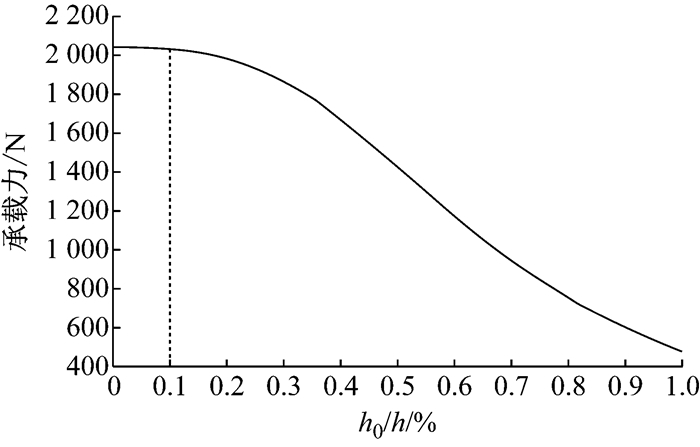 It was found that, higher oil-supply pressure assures higher radial force holding ability, but meanwhile the overshoot response would be more likely to occur. Reasonable bearing cavity depth would prevent the response overshoot and maintain the force holding ability. 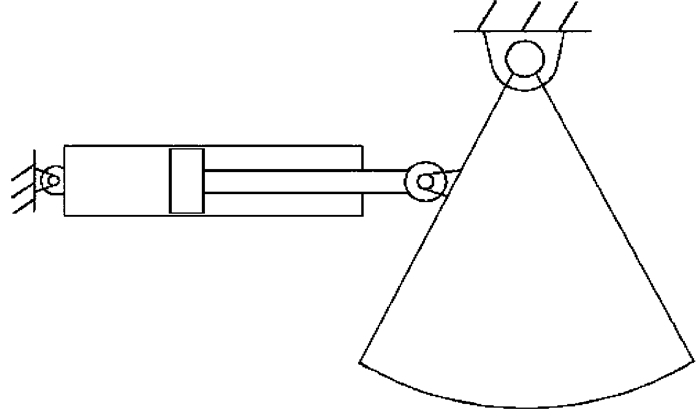 Moreover, a cone shape design of bearing cavity would reduce the leakage. 图 2给出了油缸火箭推力矢量控制系统执行机构示意图，在驱动火箭喷管运动过程中必然形成与油缸轴向不完全重合的力.研究所设计油缸公称压力14 MPa，活塞直径63 mm，活塞杆直径45 mm，正常工作时轴向力90KN.通常当径向力为轴向力的2%~5%时，径向力对油缸性能的影响已无法忽略，基于先前研究中的阐述，火箭推力矢量系统油缸所承受的径向偏载力在几百至几千牛之间，且为瞬间加载，故研究取径向偏载力以阶跃信号特点作为系统输入，区间保持在1 800 N至4 500 N之间.对于液压工程技术而言，当需要考虑介质可压缩性时，通常取有效体积模量680 MPa，即式(6)中，1/τ=680 MPa，为通常体积模量取值的30%~40%. 图 3首先给出了2 000 N中等阶跃力下，油膜间隙50 μm、静压支撑供油压力8 MPa~2 MPa时静压支撑动态特性的一般情况.由图可知，在结构参数不变情况下，活塞杆最终平衡位置伴随油腔压力的降低而愈发偏离轴心，或者说静压支撑抗偏载能力逐步退化，就超调响应而言，供油压力越高，越易发生.但供油压力(油腔压力)越大，抗偏载能力越强，如何在较高的供油压力下获得如图 3所示的4 MPa响应曲线是研究目标，由此就结构优化进行进一步研究. 为获得更高的抗偏载能力，且同时保证响应曲线不过度超调而导致油膜破裂，取计算范围内较高阶跃力4 000 N，且供油压力提升至10 MPa.在可行的参数范围内，保持油腔面积不变，改变油腔深度(0.25 mm~2.00 mm).如图 4所示，在保持油腔作用面积不变的情况下，油腔深度不会改变活塞杆最终平衡时的偏心率.考虑动态过程，发现深度大于1.00 mm均出现超调，而2.00 mm深度超调量已经超过1，此时油膜已经破裂不可逆，油缸无法按正常方式在新位置平衡，此种情况是要极力避免的. 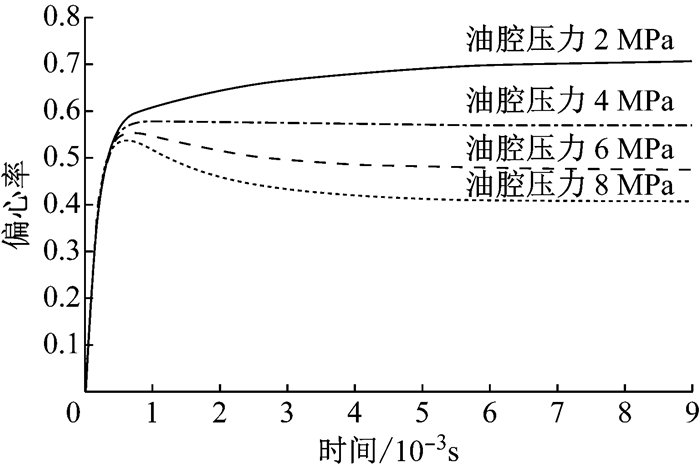 ZHAO X, HU Z, LI R, et al. 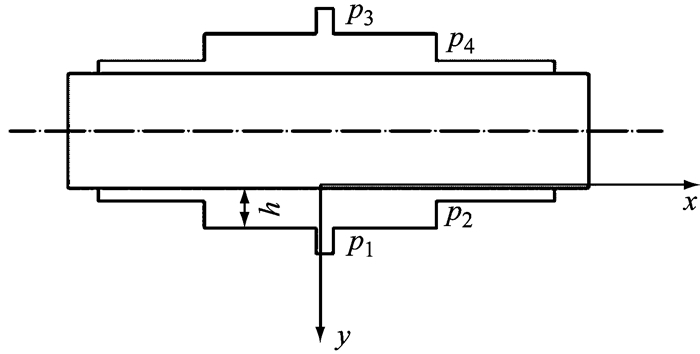 Internal leakage fault feature extraction of hydraulic cylinder using wavelet packeteEnergy[C]//Parallel Computational Fluid Dynamics.[S.l. ]: Springer Berlin Heidelberg, 2013: 363-375.